Today I bring you a sailor inspired outfit in collaboration with super chic blogger Lauren from Fashionably Lo. Since I wore this to my niece's bowling birthday party I wanted to infuse the outfit with small nautical details. I love that both Lauren and I went for similar details (great minds think alike): stripes, wide leg trousers and a bold pop of color! 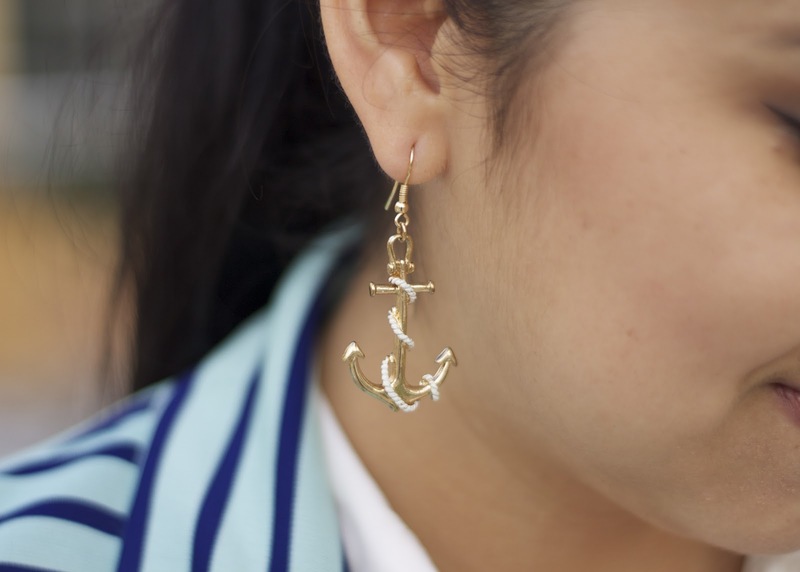 And of course I couldn't pass up the opportunity to bust out my anchor earrings! About the Outfit: ModDeals.com Striped Blazer ℅, F21 wide leg jeans and Anchor earrings, Aldo Lucite Heels, Olivia + Joy Purse (on sale!) ℅. I'm obsessed with Lauren's outfit as well- love the combo of the peplum top with the flared white trousers! See more pictures of her outfit here! Also, here is a little collage of pics I dedicate to my niece - Happy Birthday Brielle, love you! Goodies by our friends at MKR Creations (they have the cutest party ideas!) and cakes by RoniSugarCreations. Love your blazer and shoes, you so cute. Your niece is sooo sweet!! Always so effortless and beautifully put together. You look great Pau, I love how you pair the white shoe. You look so gorgeous! I absolutely love those earrings. ur earrings are super cute!!! Loving the blazer! 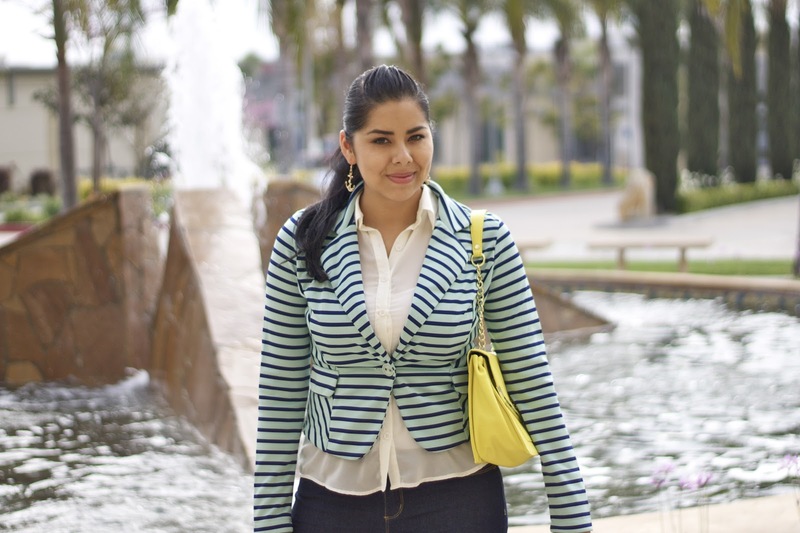 I am in need of a patterned or bright colored blazer for the warmer season! I love everything about your outfit from the jacket to the shoes, i especially love the cute earrings they totally pull the whole nautical outfit together. It looks like you had a great time at your nieces birthday! I'm absolutely loving the stripes! You look great girl!! I love the nautical outfit!! Both outfits are adorable!Love stripes! Such a cute blazer especially for summer and the pop of yellow was perfect :) hope Brielle had a lovely birthday! The blazer and earrings go well together! Love the sailor inspiration Pau! The earrings are sooo adorable and love the shoes too! Nautical is always a favorite of mine during spring and summer! That blazer of yours is so cute, and the earrings complete it so well. Happy bday Brielle, looks like she had a wonderful bash! love the stripes u look great ! Cute outfit!!! Those shoes...OMG!! LOVE!!! You & your niece are too cute!! Looks like she had a blast!